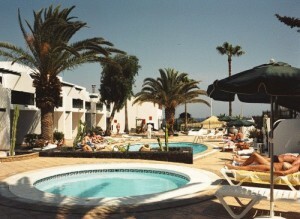 Address: Avenida De Las Playas, 51, Puerto del Carmen (Lanzarote), Islas Canarias. Apartamentos Flamingo are located just a few metres from the beach in the centre of Puerto del Carmen. They have an outdoor swimming pool and large sun terrace. The apartments have one bedroom, a well-equipped kitchen and a comfortable lounge with TV. All apartments also have a balcony or terrace. Outside, there is a pool area with sunbeds and a children’s swimming pool. The Flamingo Apartments are ideally placed on Puerto del Carmen's seafront promenade, which has many shops and restaurants. Lanzarote Airport is also just 5.5km away.